Here you will find a number of case studies involving the use of Netlytic analysis features as well as tutorials on how to you Netlytic in addition to other visualization platforms. The following paper will walk you through both content and social network analysis features in Netlytic. It uses a sample of Twitter messages from a MOOC class as a case study to analyze collaborative learning processes. How can data analysis help us improve our social media activities? This was the fundamental question BHL’s Outreach and Communication Manager, Grace Costantino, sought to address during her two-day meeting with Ryerson University’s Social Media Lab, Sept. 29-30, 2014. The Winter Olympics in Sochi has captured the attention of the world long before it officially commenced. Mainstream media has been covering the event with a mixture of negative and positive reporting. By the end of this tutorial you will learn how to create videos of dynamic networks like this one. Topic: Conversation about #blackberry on Twitter Data source: Twitter Dataset: http://bit.ly/blackberry14 Step 1: Connect your Twitter account to Netlytic Step 2: Go to https://twitter.com/search-advanced and create a test search query. Data source: Twitter Step 1: Connect your Twitter account to Netlytic Note: Alternately, you can download the “Ebola” dataset that will be used for this tutorial from https://docs.google.com/spreadsheet/pub?key=0AilmXl-I6ZWkdHlsZElNWFZsNG9qM0pqZ3JhcGstaEE&single=true&gid=0&output=csv Step 2: Go to https://twitter.com/search-advanced and create a test search query. 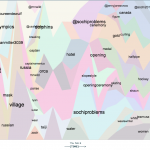 Dataset Type: a CSV file containing messages from Twitter Step 1: Download the CCK11 dataset to your computer https://drive.google.com/file/d/0BylmXl-I6ZWkV0hrV0k0LURrVVU/edit?usp=sharing Notes: This dataset contains a sample of public tweets posted by participants in a Massive Open Online Course called CCK11.